Valve's Steam Controller is a funny-looking thing—an owl-like game pad with dual trackpads instead of analog sticks. It pairs with Valve's free SteamOS and whatever living room PC it's installed on as a solution to the clumsiness of using a mouse and keyboard on the couch. In a new video demonstration, Valve does its best to convince us that Steam Controller really offers a level of control comparable to our traditional instruments of gaming. 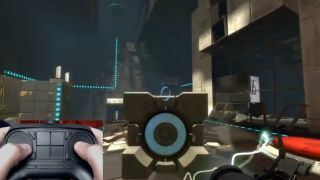 First we see Portal 2, which demonstrates that—unlike analog sticks—the trackpads can be configured for 1-to-1 control. "Directly move your thumb a fixed amount of distance on the pad, and the view will correspond to the fixed amount of distance," says Hardware Engineer Jeff Bellinghausen. Meanwhile, he says, the left trackpad has been configured as a D-pad to simulate WASD. Later in the video, Bellinghausen plays Counter-Strike: Global Offensive with great accuracy, though his aiming looks a bit slower than it might have been with a mouse—obviously, we'd need to see a comparison video of him playing with a mouse to know for sure. Civilization V and Papers, Please also demonstrate how accurate the trackpad is for mouse-based games. It looks like it works—not just like a mouse, but like something more accurate and responsive than analog sticks. Trying to move a mouse pointer around with velocity-based control is miserable, and this doesn't look miserable. Seeing isn't believing—we need to feel this thing in our hands to judge it—but it does build confidence, and Valve will be posting updates like this "frequently."